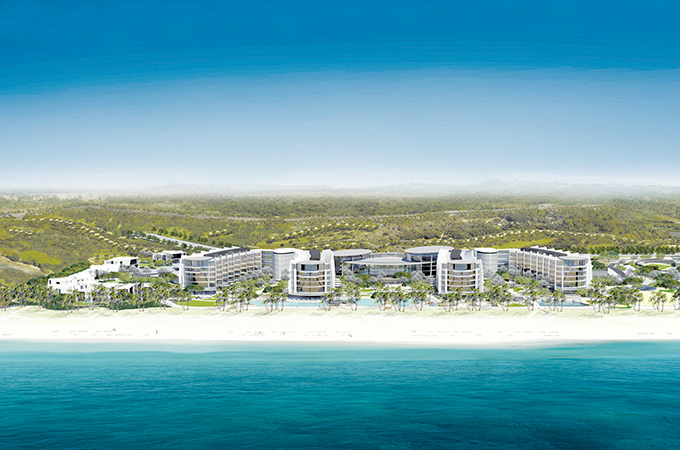 Jumeirah at Saadiyat Island Resort will open its doors on November 11 this year, bringing a breath of fresh air and understated luxury to the shores of Abu Dhabi. Surrounded by natural beauty, this contemporary beachfront resort is just 10 minutes from downtown Abu Dhabi and 20 minutes from Abu Dhabi International Airport. Located on a stunning island, overlooking turquoise waters and protected sand dunes, the 293-room hotel values sustainable tourism and will be plastic bottle and plastic straw free. In partnership with Trust Your Water, the hotel will provide solutions to eliminate the need for single use plastic water bottles. Proposed measures include complimentary, reusable plastic bottles for all guests who will be encouraged to refill at water stations throughout the hotel. In addition, local filtered water will be served in glass bottles throughout the resort. The property’s 293 rooms include eight villas with private pools and 70 suites, a spa with 14 treatment rooms and a Moroccan Hamman plus a VIP couple’s suite with a private entrance. The stylish contemporary architecture is also decorated with marine themed touches that bring the outside world to life. Guests can enjoy expansive sea views or extended patios and outdoor space from the rooms which overlook 400 metres of pristine, unspoilt beach and tranquil waters. The resort is a place where world-class art and culture seamlessly cohabit with mangroves, dolphins and turtles - the original ‘guests’ of Saadiyat Island. The modern and light rooms feature expansive sea views and six panoramic suites offer floor-to-ceiling glass walls, which can open up to take advantage of the sea breeze. There are eight F&B outlets.